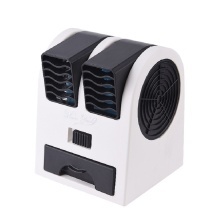 This table fan is bladeless safe and lightweight, can be used as an ordinary fan or as an air cooling fan with cool wind by adding water and some ice into the tank to cool heat when water evaporates. It is portable and convenient when you have a trip. Direction adjustable double air outlet, providing wind in different ways as your need. Lightweight and portable, not taking up too much space and easy to take everywhere. Both USB charging and battery powered are available for convenient carrying. Can add water and some ice into the tank to bring cooling wind as an mini air cooler. The bottom slot can also put perfume included, then you will enjoy sweet smell.